Ask fellow campers about "Patagonia RV Park" and nearby attractions. Looks more than a little run-down, but we actually liked our 3-day stay here. Host was available by phone but off premises and took 20 minutes to show up. Large area without cactus to walk dogs off-leash when the longhorns were not grazing. 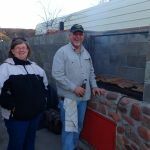 We had a pull-thru site with picnic table and concrete slab and enjoyed ourselves. Many sites were empty while the Patagonia Lake Park RV sites were full. Close to town. I especially appreciated being to run my dogs off-leash. Some shaded pull-through sites were available. We will probably stay there again if we visit Patagonia in the future. We camped at Patagonia RV Park in a Travel Trailer. Patton view site was open and amazing. I'm a beginning birder and saw about 10 new species in the first hour there. Patagonia State Park is far out of town, very large and a bit too crowded for my taste, but lots of activities available. Harshaw Ghost town is nearby. A small but poignant cemetery is there, but no other structures of note. Owner managed park, very accomodating to our needs. lots to see and do in the area. Havelinas roam in the evening. Patagonia is a fun place to hang out, it has a flavor of the old West. We camped at Patagonia RV Park in a Travel Trailer. Drive the mountan roads for spectacular scenery. Be sure to visit Tubac Az while you are here. Very quiet, not crowded at time of our visit. Close to town. Owner/Manager friendly but office hours sort of irregular. Nice laundry facilities available. We camped at Patagonia RV Park in a Motorhome. Clean, tidy and well cared for RV park. Superb WiFi - no trouble streaming movies. Host was friendly and helpful. Laundry area was spotless as was the shower and restrooms. Quiet, a short walk from downtown Patagonia and close to The Nature Conservancy's Patagonia Preserve - excellent birding. We spend a week here each year. 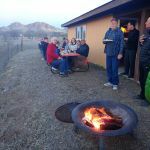 Best RV park we've found in Arizona. Highly recommended. We camped at Patagonia RV Park in a Travel Trailer. Restaurants: Mercedes for real Mexican food; the Gathering Grounds for breakfast and coffee, pastry, ice cream and such. Not the Velvet Elvis - expensive and ... not very good. This is a nice little RV park with level sites and fast wifi. There's no TV unless you have your own satellite dish or buy their DirecTV connection. Our pull through site was very level with grass. Hookups were fine. There is an orchard next door with a gate and walking path to take the dog. The park was very quiet and pleasant. There was nothing to complain about. Nearby Patagonia Lake State Park was packed while this RV park was less than half full. We camped at Patagonia RV Park in a Motorhome. Small park just outside the 'center' of the town. Very quit, day and night. All sites are level and spacious, some pull-trough's. Two restrooms and one shower for men and the same amount for women. All clean. Some RV parts for sale in the small office. DirecTV available for $ 2.50 per day. Flawless fast WiFi, even streaming is possible! Recommendable park. We camped at Patagonia RV Park in a Fifth Wheel. Patagonia is a good stop if traveling the southern AZ routes. We stopped for a few nights. Our 45 foot RV would not fit in the back in site the owner wanted us in. The tree branches were too low to back in enough. Fortunately there was only one other RV at the park at the time so we pulled across into one of the pull through sites and used all of it. Utilities worked well. TV and internet were okay. Owner a bit eccentric as another reviewer stated, but nice enough guy. If we were in the area again we would try the State Park. We camped at Patagonia RV Park in a Motorhome. This is our second winter staying at this park for a couple months. This year we were there from January through March. Very enjoyable - friendly folks, and the owner is great. Park is always clean and quiet. Walking distance to town, and lots of outdoor places to explore. Very reasonable rates by the month, the cable TV is very helpful, and the internet is fantastic, even for streaming movies. Our Verizon phones work very well here too. Big bonus is the park is highly dog friendly with a 4 dog limit. We like that. We'll be back. We camped at Patagonia RV Park in a Motorhome. Small RV park with full hookups. Cable does not get any network channels; Wi-Fi is excellent. Owner a bit eccentric, but fun to talk with. Few trees; some sites a bit hard to get into. But the scenery and the birding. Be sure to see the cemetery at the Harshaw ghost town site. Old time gas station in town with very friendly owner; gas was $3.99, but worth it for the full-service, conversation and clean windshield. Town is quaint, a few galleries and a few restaurants. We camped at Patagonia RV Park in a Motorhome. Not much to look (thus a rating of 8) at but extremely comfortable. The Wi-Fi is the best we have ever encountered. We stayed for 2 months and were very happy. Easy walk into town, quiet park, very friendly and the owner is always on site and available to take care of any issues. The pipes froze and he stayed around and took care of everyone. Dogs are very welcome and this is a truly 'pet friendly' park. We will be back!! We camped at Patagonia RV Park in a Motorhome. 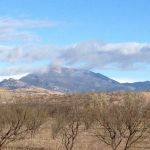 We camped here to enjoy the birding in southeastern Arizona. Patagonia is a cute little town, and this is a nice, quiet little park. There was plenty of room in the pull through site for our extra-long rig. The owner was very pleasant, and the sites were level. Very pet friendly. Highly recommend the Velvet Elvis for gourmet pizza. Will definitely stay here again. 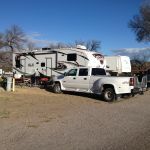 We camped at Patagonia RV Park in a Fifth Wheel. This is a small park with not much to do. It’s a little pricey for what you get. We really only stayed here because it was convenient to Nogales, and we were preparing to cross the border into Mexico. We also needed to receive our mail here, and they gave us a PO Box to use. However, they rarely go into town to check their box, so we had to convince the postmaster to give us our mail directly. Sites were a little tight for backing in, and people didn’t clean up after their dogs. The camp has a nice coin-op laundry, but it turned out that many town residents use it, so it was hardly ever free. We really liked the game room and used it quite a bit. The cell phone coverage was great, and our Verizon air card worked fine. Most of the people staying here are hunters. We left a tub of birdseed outside, and it was raided by peccaries. Apparently, they can pop lids off tubs. We camped at Patagonia RV Park in a Travel Trailer. Simple park, in a simple little town. The owner was great, and the area is absolutely beautiful. I loved my stay here, and can't wait to return to better explore the areas surrounding this gem of a town in Southern Arizona. We camped at Patagonia RV Park in a Travel Trailer. Small campground but we found nothing to complain about. Restrooms and showers were just immaculate. They are key coded for entry and this could be a problem as the office is not continuously staffed and those arriving while it is unmanned will not have immediate access. We stayed two nights and were perfectly happy. We camped at Patagonia RV Park in a Motorhome. Great Place to spend a few nights. Park management/owner very helpful. Facilities in good clean condition. Restroom and showers very clean and neat. We camped at Patagonia RV Park in a Motorhome. Are you affiliated with Patagonia RV Park ?